The Mac Santoku 6.5″ Chefs Knife is perfect for those who want ultimate performance. From the moment you pick up this blade, the quality becomes apparent. It is the highest priced Japanese chefs knife in our review, but it offers the complete package and will effortlessly slice and dice nearly everything you throw at it. This knife is part of Mac’s Professional series and has received some acclaim. In fact, it comes with a recommendation from Cook’s Illustrated Magazine. This knife is more than capable of taking on whatever a commercial chef requires. The razor sharp blade is dimpled so that food won’t stick, and the balance is nearly perfect thanks to the bolster and riveted handle. The blade is smaller than average, at 6 ½ inches. It’s size makes it ideal for precision cuts, and very thin slicing. The granton edge on the blade helps this blade easily cut the skin and outer layer of vegetables, so each cut is smooth and even. For a knife of this size, the blade has significant depth. For the rocking motion style of chopping, this comes in hand. The blade is very sharp. Forged with the highest quality Japanese steel, Mac’s knives are known for their sharpness. The granton edge, which runs along the entire blade, helps the knife ‘grab’ into whatever you’re cutting, making for smooth, effortless slicing. The Mac Santoku 6.5″ Chefs Knife is comfortable and easy to use. The blade is very well balanced, with a sizable bolster and tapered handle. It’s lightweight, so it fits well in the hand and will not tire your wrist out. The Mac Santoku 6.5″ Chefs Knife is proven and known for it’s high quality throughout the culinary industry. 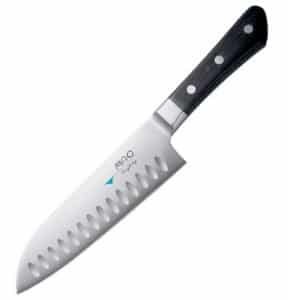 In fact, Cooks Illustrated rated it as the Best Santoku knife. It’s chosen by chefs who require exact precision and finesse from their knives. How well does the Mac perform against other chefs knives. Take a look at this review video which puts it through its paces and if you are impatient, skip to nearly the end to see the top two recommendations. Although the blade is very sharp, it’s also very hard, leaving it susceptible to chipping or fragmenting in some cases. It’s best to not use this knife on very hard cutting boards or very hard vegetables. The thin edge requires more sharpening than some blades. For best results, a ceramic knife sharpener should be used after every few uses. The Mac Santoku 6.5″ Chefs Knife is known for it’s incredibly sharp edge that excels at the finest and thinnest cuts. It is well balanced and lightweight, using a bolster and three stainless steel rivets to create a healthy weight distribution. The granton edge provides a smoother cut and helps prevent food from sticking, which comes in handy for those extra thin slices. Mac Santoku 6.5″ Chefs Knife – This is a world-class japanese chef knife and the price reflects that, as this is the most expensive in our guide. With that being said, these is a chefs knife that will maintain it’s sharpness very well with minimal sharpening required.